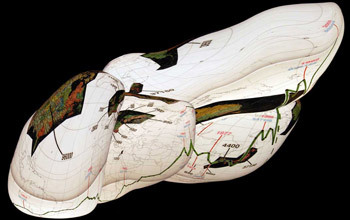 The Places & Spaces exhibit demonstrates the power of maps – in a different way. Maps of physical places have helped guide mankind's exploration of the physical world for centuries. They enabled the discovery of new worlds, while marking territories inhabited by the unknown. Without maps, we would be lost. So-called "domain" maps help navigate the world of science by showing how bits and pieces of knowledge can be connected. They can also track the emergence, evolution and disappearance of topics, while pointing to the most promising areas of research. For more information, visit the Places & Spaces web site at http://scimaps.org/. To learn when and where upcoming exhibitions will be held, visit http://scimaps.org/exhibitions/.